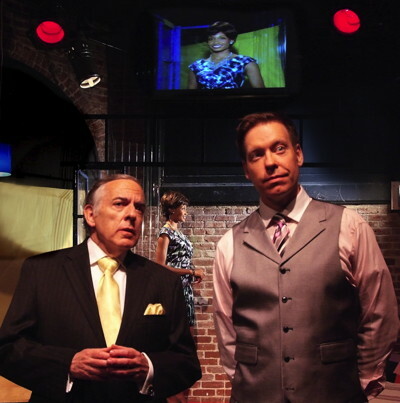 Theresa Rebeck’s latest play, currently making its West Coast premiere at the Lounge Theatre, is an odd one. Striving to combine scathing satire with black comedy, the production’s uneven tone renders many of the comedic scenes too dark for laughs. Additionally, a weak performance from one of the leads seriously undermines the action. The contemporary storyline switches between the offices of a TV network and a home in St Louis shared by a bickering quartet of adults. Having moved easily between the worlds of theater and television, it’s clear Rebeck has found both media to be rich with story and character inspiration. Her portrait of the capricious network executive somehow seems accurate and far-fetched at the same time; it’s true men who wield this level of power fire people on a whim, yet the way Wes is portrayed and played his behavior lacks gravity and veracity. Scenes that feel as if they should be broadly funny simply fall flat or are drained of comedy by the horror of the drama. The best scenes involve news producer Stu (played well by Patrick Hancock) arguing to maintain a high standard of news coverage in the face of Wes’ penchant for lowest-common-denominator television programming. There are times when Rebeck’s plot simply does not gel. Kiff Scholl’s staging is also odd; this is a crowded presentation with everything and everyone on stage all at once. Approximately 1 hour, 50 minutes, including a 10-minute intermission. Call (323) 960-7773, or reserve tix online.